Recent years have witnessed a resurgence of the ‘end of ideology’ thesis, not as a theoretical stance but as a reaction to what appears to have been the decline of major ideological families, such as socialism, in a changing world order. Globalization, as well as internal national fragmentation of belief systems, have made it difficult to identify ideology in its conventional formats. Previously published as a special issue of The Critical Review of International Social and Political Philosophy, this volume challenges the notion that we are living in a post-ideological age. It offers a theoretical framework for exploring some of the new manifestations of ideologies, and combines this with a series of case studies relating to recent ideational phenomena, such as populism, environmentalism and Islamic fundamentalism. 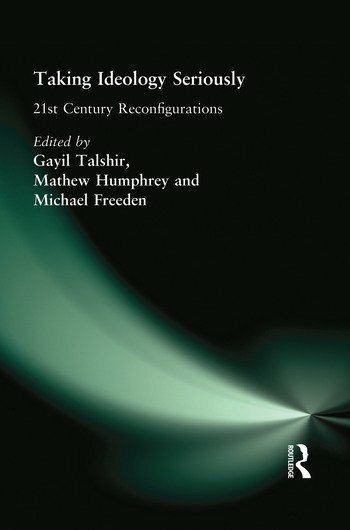 The contributors reassess some typologies, such as the left-right axis, as an explanatory device and use ideology research to bring together different scholarly perspectives including party-political analysis, the history of ideas, post-Marxism, and movement politics.